One of the most common questions that I am asked is whether or not the pearls I use are cultured. Developed by pearl guru Kokichi Mikimoto in the 1920’s, cultured pearls comprise nearly 100% of the pearls available on the market today. Natural pearls make up less than 1/1000th of a percent of the total pearl trade. Cultured pearls are grown on farms. 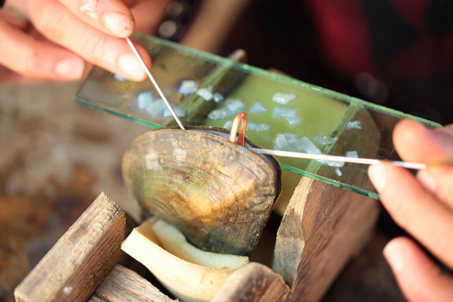 Pearl producing mollusks (typically not oysters, contrary to popular belief) have an irritant – such as a small piece of shell or mother of pearl – grafted onto their interior mantle. The mollusks are then returned to the ocean, where they are cared for over 2-6 years while the pearls develop. 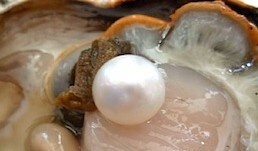 A single mollusk can produce up to 34 pearls per cycle. 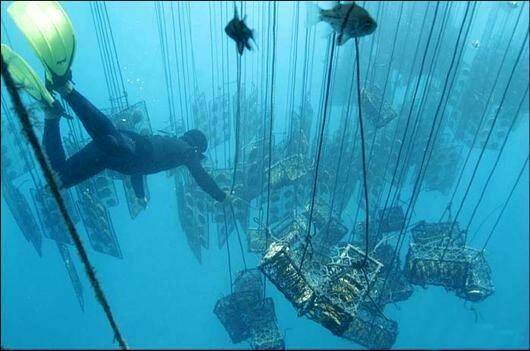 To harvest pearls, the mollusks are retrieved and opened very slightly. The pearls are extracted, the mantle re-grafted, and the mollusk returned to the ocean beds to begin another growth cycle. What I find so interesting about this process is the global, ecological, and economical role of the cultured pearl industry. Recently, I learned about a movie that explores these very issues titled Power of Pearl. Exploring how the pearl industry in the Philippines, Indonesia, and Australia impacts local communities, provides education to women and children, preserves dying cultures, and repairs the oceans, Power of Pearl tells the story of the unique relationship western pearl farmers have with their workers and surrounding communities. Um, yes please! Learn more about the film here. This entry was posted on April 4, 2014 by elisabeth in pretty pearls and tagged pearl culturing, pearl diving, pearl movie, power of pearl movie.